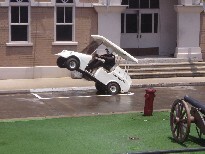 So far, one of my favorite parts of staying in The Villages are the golf carts. Each individual village also has a town square kind of place. You’ll find various restaurants and stores in each village. So today we took the cart and headed to our town square for lunch at McAlisters Deli and a brief stop at Publix. There are several stores for various shopping wants in each town square. We don’t buy much if we don’t need it, so we haven’t been into any of those yet. Maybe we’ll get bored and go look at what we don’t want to buy.